You may have noticed some Google search results pages (SERPs) include a Google+ photo of the webpages author. For example with this site a search for Stallion Responsive (name of the Premium WordPress Theme Package I develop) in Google shows my Google+ photo to the left of the Google listing for this site. Which makes the sites in the SERPs with Google author profile image links stand out and might generate more click thrus: that would be more search engine visitors. If you don’t already have a Google Plus Profile you’ll need to signup with a Google service. Google has so many services, if you have used Google Webmaster Tools, Google Analytics, Google AdSense, Google AdWords, Gmail…. you either already have a Google+ profile or are a few clicks away from one. Click this link and it will take you to your Google+ profile URL if you have a Google+ profile: Check Google Plus Profile. 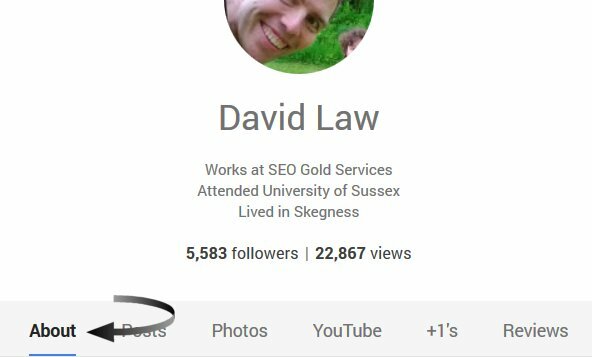 My Google + profile URL is: https://plus.google.com/+DavidLaw/posts can also be accessed via https://plus.google.com/115218034784885853617/ (there’s an option to use a name). For the Google authorship markup example below I’m using https://plus.google.com/+DavidLaw/, doesn’t matter if you leave the posts bit on or remove it like I do. Stallion Responsive includes built in support for the Google authorship rel=”author” meta tag, in short Stallion Responsive will add this code to the head section of some or all sections of your WordPress blog. For Stallion Responsive Theme users go to “Stallion Theme” >> “Promotion Options” and add your Google Plus profile URL into the “Google Authorship” form and click “Save Settings”. You can double check the authorship rel=”author” meta tag was added correctly byt going to your sites home page in a browser like Firefox of Google Chrome and “Viewing Page Source”: in FireFox/google Chrome it’s “Right Click” the web page and click the “Viewing Page Source” option. Stallion Responsive includes an advanced WordPress SEO comments feature that turns your larger comments into post like pages (Super Comments), you can see examples in the comments below (click the link in the bottom right corner of larger comments). Since comments have multiple authors we don’t want every comment to be associated to the WordPress blog owner, so unless you are the only commenter on your WordPress blog keep the “Hide on Super Comments ON” ticked: this setting results in the Google authorship rel=”author” meta tag NOT being added to the super comments pages. Google has added features to the authorship markup that when a site is linked to a Google+ profile (next step) if the Google+ profile name and comment author name matches it will link your photo with your comments. Basically on my Google+ profile my name is “David Law” and I use the same name “David Law” for my WordPress comment author name, Google scans the site, finds on the super comments pages created by me include my name “by David Law” and link them to my Google Plus profile even though there’s no meta tag (cool feature). Google usually doesn’t link other author comments, but Google isn’t perfect… Hmm, wonder if others could link their Google+ profiles to my site and ‘claim’ their comments? 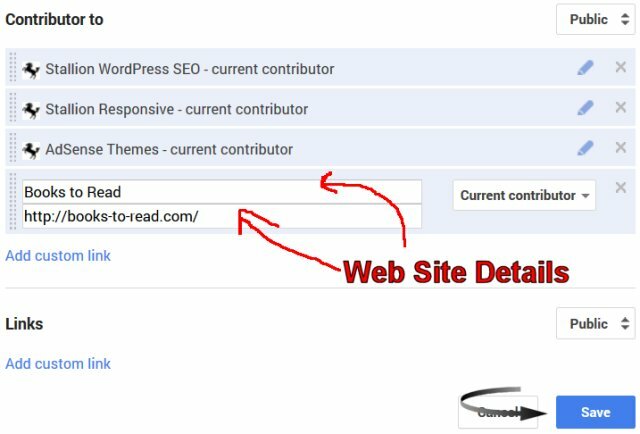 Now we’ve linked your WordPress site to your Google Plus profile, next we have to link your Google+ profile to your WordPress blog. 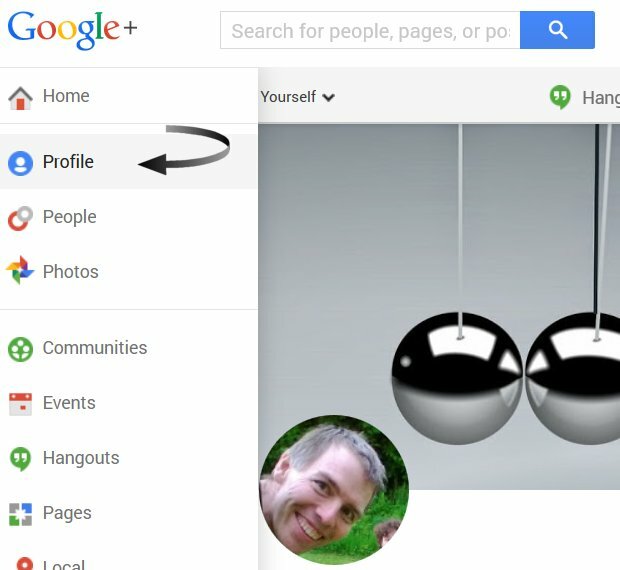 Log in to your Google Plus account and Hoverover the “Profile” link on the left and click “Profile” on the dropdown menu. Don’t forget on your Google+ profile to add an image of yourself, the authorship feature is meant to link your articles to you, if you don’t add a photo of you or add a photo of something else Google might not add the Google plus image to your search results. 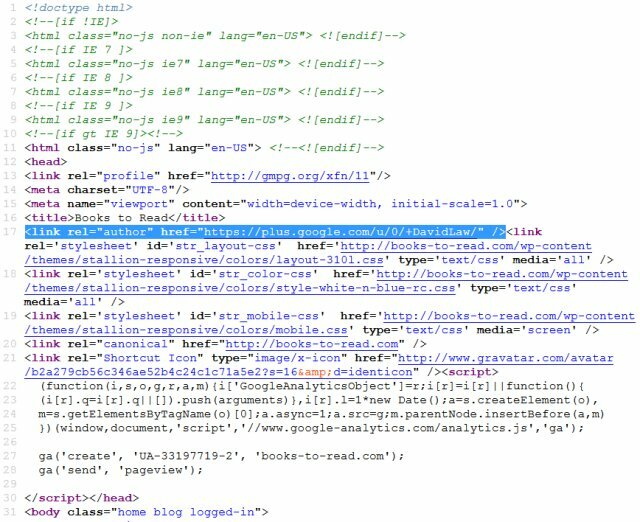 Note: if you are running a WordPress cache plugin be sure to clear the cache first, the Rich Snippets Tool could be looking at a old cached copy of your site that will lack the Google authorship rel=”author” meta tag. Click the image above, if your Google Rich Snippets results looks like the image it’s setup correctly. There you go, a very simple way :-) to have your Google Profile linked to your search results. All you have to do now is wait for Google to re-index your site and add the data to it’s search results (no idea how long this takes). I use to see popular bloggers have their profile linked with search result. I was searching for this to integrate my Google profile in my blogs search. I would like to ask, what other options in the Stallion SEO Ad Theme 6.2 should i configure in order Google picks up and indexes the image ? 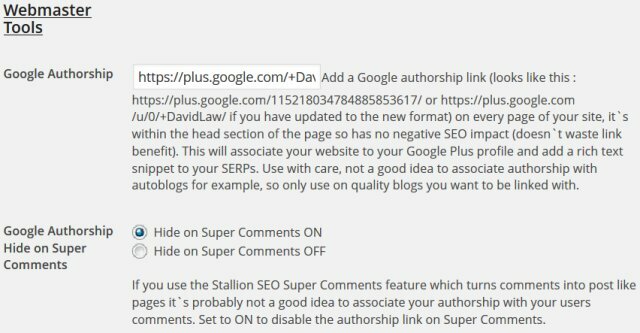 Also What about on the Stallion WordPress SEO Plugin Options ? Anything i should do there as well ? Having your Google+ image associated with your sites Google search results isn’t part of Stallion 6 (yet). You have to set it up as described above or use another method. Google has changed what works a couple of times and I’ve had problems getting some sites to be considered mine (get my Google Plus image associated with SERPs) so I’m not 100% sure how it works! I wrote this article in July 2011, I setup highlighting code for this site before the end of July and it took over 6 months to work! Another site I setup at the same time took about 3 months for the images to show up, so be very, very patient. 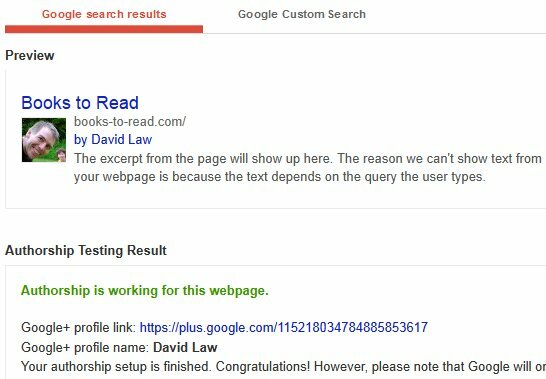 Check the Google Webmaster Tools Rich Snippets Testing Tool for your domain and if it says you have it setup correctly WAIT months for your Google Plus image to show up. If it says something isn’t setup correctly fix the problems. Having a bit of trouble getting my Authorship validated. Is there a simple step I am missing? I added my website to my Google account under “contributor to”. Put my account link for my Google account under my WordPress profile under my user. Is there anything else I need to do to get Google Authorship to work on a webpage with the theme? Do you think Authorship verification is an SEO factor in 2013? Have you checked the website with the Google Structured Data Testing Tool? I see the issue, it works for my individual pages and posts where I have a Bio. I was checking my main page. Which does not have a bio box because it does not have a static page. I would need to manually add a Google rel = me for the home page or make it static. If there is an easy way to do it in the theme, let me know, otherwise I will manually add a link. I imagine a widget would not look as good in lieu of the bio box. Would the Bio-box link like you have it now with the same anchor text be seen as not good SEO wise? I guess I am getting nervous when I add anything less unique more templatey or repetitive, to a page. In other words, is this another thing that will appear on all my hundreds of pages. Not bad in small doses but I do not want to tip the scale too much. Just a thought. Less template foot print the better. 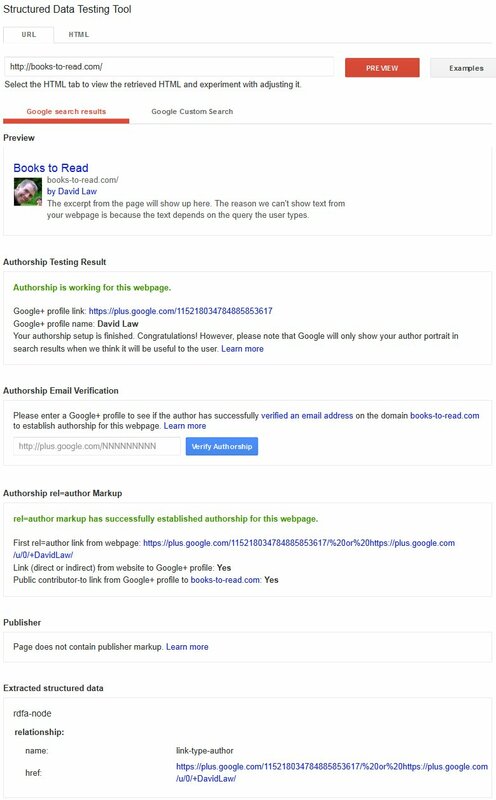 I believe something like authorship is in some complex way connected to Google Trust rank. I believe the next big update of Penguin 4 which was just alluded to will include a merchant trust update connected to scam or fake reviews vs verified authors with a good trust rank. Yes you have to add the rel tagged link on every page of the site since you can have multiple authors on a site, so every page is an individual island authorship wise. Is the Google Authorship Link out Worth it? I agree with everything you have written. I tend to think that “authorship” will play role in an indirect way. But you are right, it is not the end all. I tend to read a lot of SEO forums and then lose perspective. It certainly helps the clicking on search results as imagines in results draws attention. However, that being said; do you think the link-out to Google + which is basically a link out on every page of my higher quality websites, is worth claiming authorship? Is there an SEO way to handle the link out? I think with that much PR and linking going to my Google + page it will rank high, but is it worth sending that much juice out to something that is just a stream of reviews and likes etc. on various topics? It might be, or not. Maybe if your Google + is thematically related to your one main site I can see this as a positive. Or maybe Google handles a link to Google + in a different way. I do notice under an SEO browser view you send a lot of link outs to various social sites. You’ve misunderstood how to link everything together. Link every page of the site you want authorship of to that page using the rel=”author” tag. Add a link from your author page to your Google+ profile page like you see on the post above. Link your Google+ profile back to your author page. So there’s only one link needed per domain to your Google+ profile. Update: the above is no longer needed. This I understand and your are correct. However, look at your biography box under a search engine simulator. All the social media links are ‘real’ links leaking juice to social media sites, including Google +. While the social media links at the top of your post wisely, do not pass PR as I think you have them in Java. Also the Social media on the side to the right side also leaks PR, I think under a search engine simulator. I think linking out to Social media is bad if they are ‘leakers’? I thought since I have a real live link to Google + in my bio-box it would do the trick anyway. I could claim ownership on all my pages (could be good). However, I am hesitant to use the bio-box because of all the leaks and repetition of text. But if you link out to social media on all your pages, I thought it must be safe? Anyway, as always you know I really appreciate the guidance and sincerely appreciate your patience. Although you are correct about wasting link benefit by linking sitewide to social media sites like Facebook, Twitter etc… look again at the social media links on this site, none are ‘real’ links. 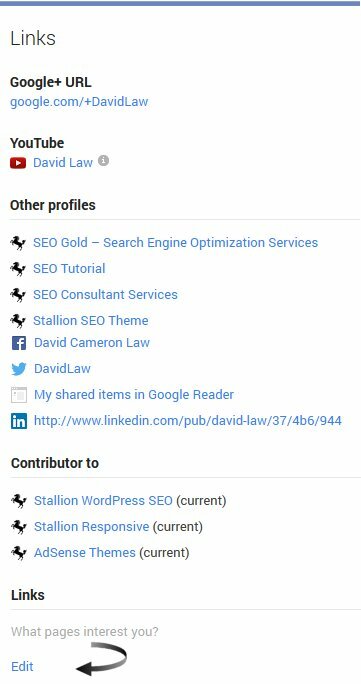 Both sets of social media links are using the Stallion Link Cloaking feature, those links are invisible to Google and other search engines. Note you can have the links pass PR, though not a very good idea. Google reads those links as an image surrounded by a span tag, not an image link. It is just Java, something that is used on almost every website. Yet, I would rather err on conservatism and not activate that feature. I can not see how it would be a penalty as the end use can use this. yet I get a little paranoid. All that I wrote above do you think I am correct? So until my worries subside, I will think of another way, either put a Google + link on all my pages (that is a lot of juice leaking) or do something like you recommend, that is have pages linking to my “author page” that links out to Google +. My smaller sites, not a big deal, but my larger sites with 100s or 1000s of pages, I do not know if I want one page getting that much juice as it might distort the natural flow of things. Since Panda hit my sites, I have been trying to add content and really improve the quality of my posts. So when I finish an upgrade to a post I do not mind signing my name to that post. Therefore, most of my post will deserve Authorship claims if I upgrade them. So I have to think about this and weigh my options. The question for me is how would adding 16 sitewide links (which would count as 8 links since they are duplicate sets) that pass full SEO and link benefit to Google+, Facebook, Twitter, Linkedin, Stumbleupon, YouTube, Flickr and Feedburner help Google’s users? 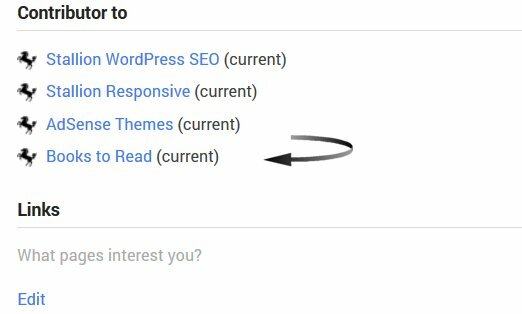 I’m not linking to those sites to recommend them as relevant resources to this site, they aren’t about WordPress, themes, SEO etc… I’m linking to them to promote my social media type profiles. If I added 8 sitewide links to 8 of my random domains from all 130 domains I own (millions of backlinks), I’d get my entire network banned for being a link farm! Though I don’t think Google would penalize a site for linking to Facebook sitewide, I don’t think it adds anything useful either and it would damage this sites SEO since the links aren’t relevant to the sites content. Another way of looking at it is would Google have a problem with adding a link that’s not clickable like this one: http://www.facebook.com/david.c.law that goes to my Facebook profile?